Note: This article is sponsored in collaboration with ProveSource. Have you ever seen a line up going around the block for a new restaurant and made a mental note to try it out sometime? Or maybe you’ve seen a crowd gathering around a street performer and went over to see what all the fuss was about? These are examples of social proof and in this ProveSource review, we’re walking you through how we cultivate this social proof feeling online when you can’t actually see any customers around. Learn more about how we use ProveSource and why we love it in this review. ProveSource harnesses social proof by helping businesses turn website traffic, sales, and data into relatable insights their customers can see. They give online businesses that busy-store feeling to entice other visitors to come and see what all the fuss is about. The way they do this is simple: They give you the tools to create custom notifications that pop up on your site so visitors can see them while they browse. The messages on these notifications can be custom-made depending on your type of business or website but the ultimate goal is the same: To make your website visitors feel like they’re in a busy and bustling store where other customers are making purchases so they will want to make a purchase, too. 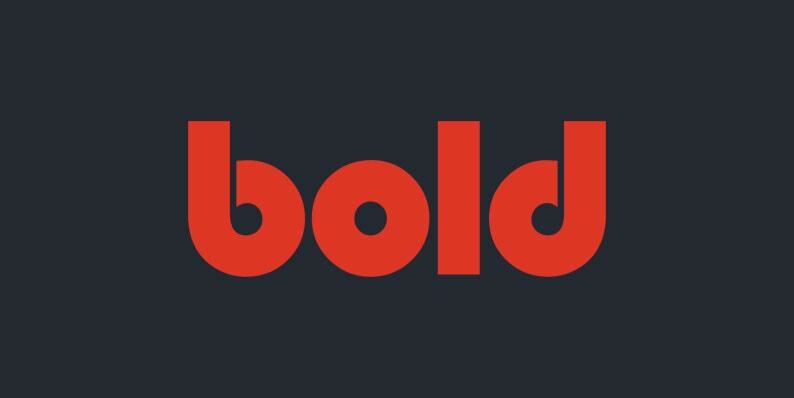 This, in turn, builds the credibility of your brand and boosts your visitor’s confidence in your business which is a powerful combination of attributes which can lead directly to fostering a more loyal and active customer base. ProveSource is for business owners and operators who want to see their traffic grow and their conversions improve. Because ProveSource lets your website visitors feel like they’re in an actual store with other shoppers, they’ll be more inclined to shop around and more inclined to make a purchase. Plus, with your notifications popping up on their screen, they’ll be able to quickly navigate to parts of your website you want to drive traffic and conversions to. If it’s hard for your customers to get a grasp on how popular your online store is or that there are lots of customers shopping from you online, or even if you want to start generating a feeling of urgency within your website visitors to make a purchase on your site or to compel them to make purchases more easily, then ProveSource is an ideal tool to use. ProveSource notifications give your website visitors the information they need to assess whether they can trust your online store or not. We love using ProveSource on our site because just by adding this one simple tool we’ve been able to grow our traffic and boost our conversions noticeably. We listed ProveSource as one of our Top 10 Favourite Business Apps of the year for this very reason: The social proof notifications we’ve been able to create with their tool have proved to be very engaging for our visitors and they’ve consistently been helping our visitors discover products, tools, content, and resources on our site that other customers are buying or downloading. This instant source of information coming from the ProveSource notifications gives our visitors an accurate look into what products are popular on our site, and that helps our visitors make more informed purchases. 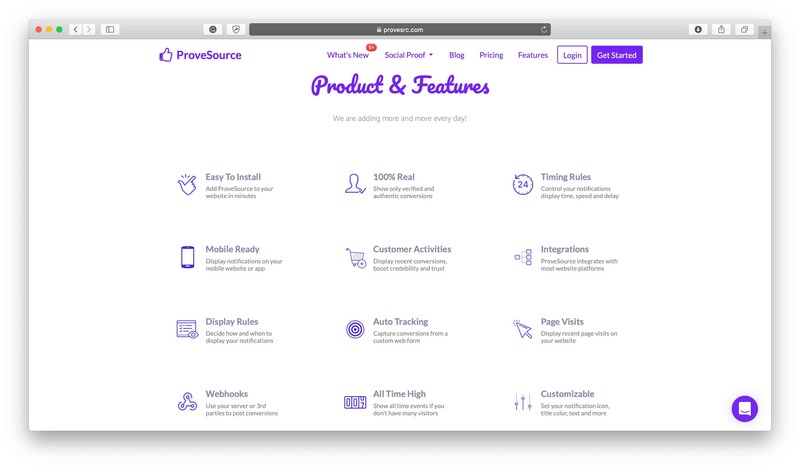 We also love using ProveSource because we’re a small team and having a tool like ProveSource that runs in the background while we focus on other tasks is exactly what we need. We know that ProveSource has the social proof side of things handled and it’s helping us generate more traffic and increase our sales without us having to put more time and effort into making these things happen. It’s extremely convenient and a no-brainer tool for us to use based on the return-on-investment we receive from it. Not only is ProveSource a tool we get a lot of value from but we also think it’s a tool a lot of other online businesses and websites can get a lot of value from, too. No matter what kinds of products you sell online, it’s likely that ProveSource will help boost your traffic and conversions so you can build a loyal customer following just like we have. In this section, we’ll discuss the two major aspects of ProveSource that bring us the most value: Notifications and metrics. What makes ProveSource stand out amongst other social proof services in the ecommerce industry are the types of notifications that can be created with it. So much of the notification aesthetics and process is customizable so it’s possible to create social proof pop-ups that will match your brand and look good on your website. Each of these notifications can be customized to suit your website and the type of products you sell, plus you can add a call-to-action link to some or all of your notifications so your visitors can click through to see the product, content, or resource the notification was promoting. Another big part of how we use ProveSource for our online business is to monitor the engagement we receive on it so we can determine if it’s actually making a difference to our traffic and conversions. As you can see, there’s a lot of data here that ProveSource tracks which you can use to make informed decisions for both your social proof notifications and your business. 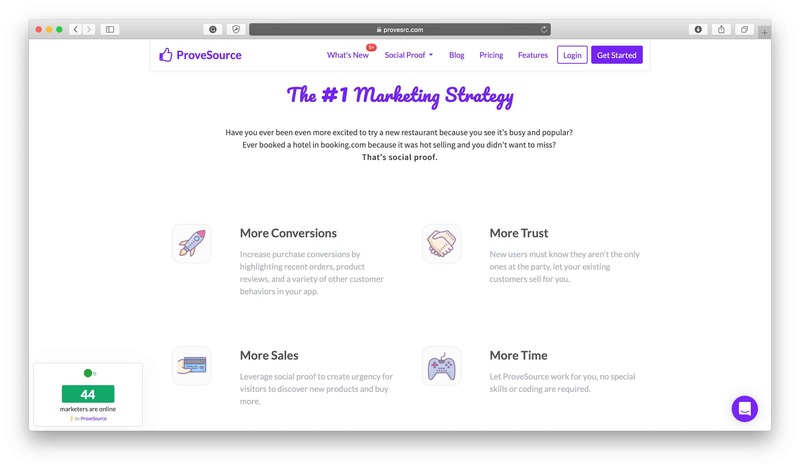 ProveSource integrates with many services and platforms so you can show compelling social proof notifications no matter where your business or website exists online. In terms of ecommerce platforms, they integrate with Shopify (check out the ProveSource Shopify App here), WordPress, BigCommerce, Magento, Squarespace, as well as many others, and as far as other integrations, they connect with Zapier, Stripe, PayPal, MailChimp, and more. For a full list of ProveSource’s integrations check out their full list here. Show notifications in your local language with ProveSource’s language options. They support more than 20 languages and counting so you can communicate with your website visitors in a way that best suits them. The biggest advantage of using ProveSource is that it’s one of those tools where you can just set it and forget it and it will do a lot of work for you in the background of your day-to-day hustle. 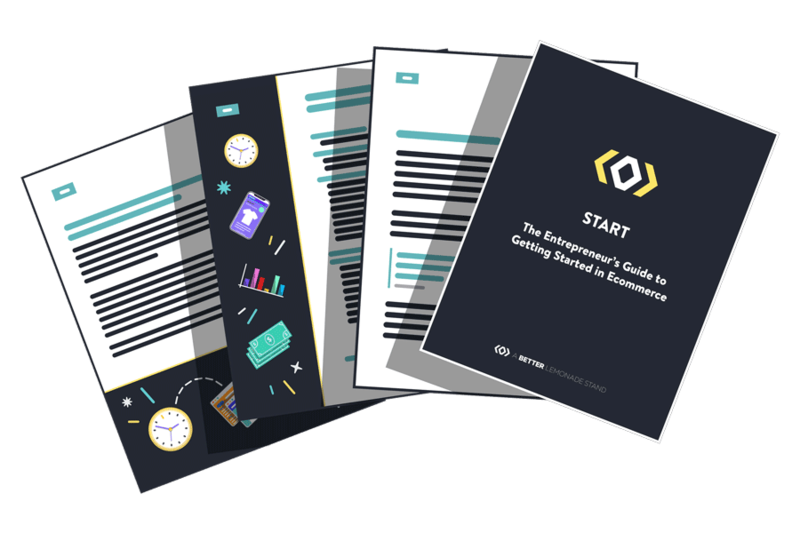 Once you get started, there’s very little maintenance required to keep everything running smoothly so you can sit back, relax, and watch your traffic and conversions increase just from this one simple tool. ProveSource’s pricing is very reasonable and accessible for startup and high-traffic businesses alike. We particularly love that ProveSource’s free plan isn’t time-limited, meaning there isn’t a time limit on how long you can use their service for free, as their pricing plans are entirely dependant on the monthly unique visitor count you need and whether you want their watermark removed from the notifications. If you’re just getting started and want to try out their service, all their features are accessible in the free plan so you won’t be missing out on any of the good stuff. Learn more about ProveSource’s Pricing Plans here. Social proof is one of the most powerful ways to drive traffic and conversions to your site because it acts as a signal from consumer to consumer that your brand is reputable and worthy of their business. If you aren’t already harnessing the value of social proof you’re missing out on increased engagement and sales that could be boosting your bottom line and building a loyal customer following. Get started with the ProveSource customized social proof notifications to reach your website visitors more effectively without putting in much extra effort behind the scenes.